Thirty years since Colin Jones seminal exhibition of The Black House at the Photographers Gallery, we are proud to announce a new exhibition of one of the most volatile photography projects of the 1970s. In 1973, Colin Jones was commissioned by the Sunday Times Magazine to illustrate a front cover article entitled On the edge of the Ghetto about the Harambee housing project in Islington, known as The Black House. This tall, dilapidated terraced house on a busy main street in Islington, had became a hostel for troubled young black men run by a charismatic Caribbean migrant, Brother Herman Edwards. The project was often visited by the police and always in strife with neighbours over too much noise and overcrowding. Many of the youths photographed embraced their portrayal in the media as iconic delinquents, reinforcing their status as outcasts. Never officially named The Black House, the building was given this name both by residents and by newspaper editors as an easy headline. 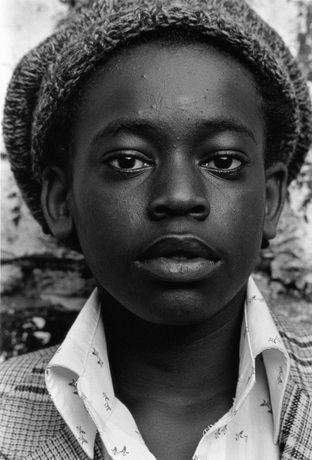 At this time, the first generation of Afro-Caribean young people to be born in Britain were encountering problems with schooling, employment and the law, Jones photographs put a face to this news story. Following a grant from the Gulbenkian Foundation and the Arts Council, Jones continued to photograph the project until 1976 when it ended in disillusionment. The resulting photographs of rootless, alienated youth are no less haunting today than when they were taken. In 1977 they were exhibited in a controversial exhibition at the Photographers Gallery and toured the country until the exhibition was vandalised in Leicester. This new exhibition is an opportunity to revisit the vanished environment of the Black House, preserved in the humanity and dignity of Jones photographs.